A ship inspired design of a house that sits near the beach. When we hear about beach homes, what comes to our minds at once is a nautical themed space or a home that is inspired by the ocean. Yes, that would be a nice dwelling indeed. I have seen homes with this design. Others even give their home’s architecture a ship design but of course, that is not necessary. Others merely stick with the design they like for a home and consider the effect of the ocean to the structure that is being built. 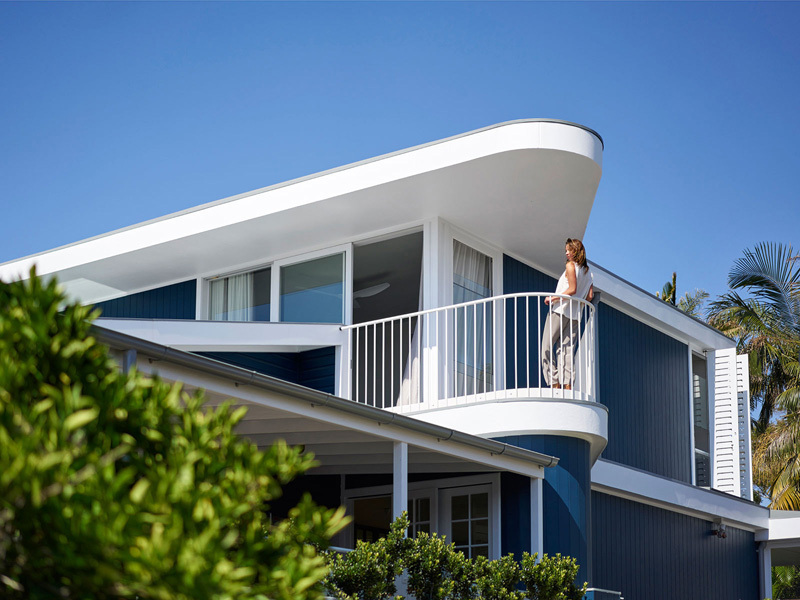 Today, we are going to feature a house that is located near the ocean. 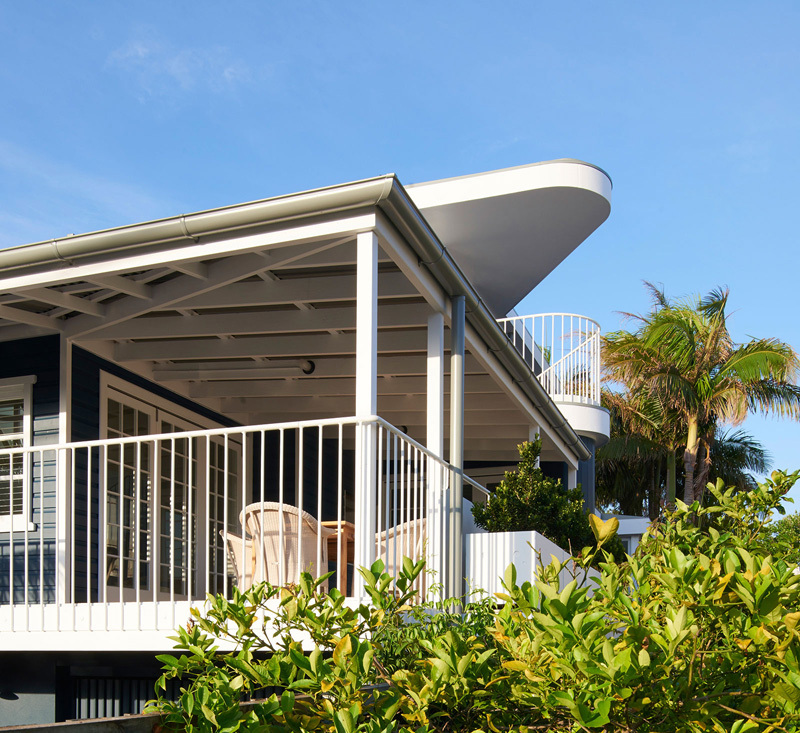 It is an addition to an existing bungalow in Sydney, Australia which is designed by Luigi Rosselli Architects. 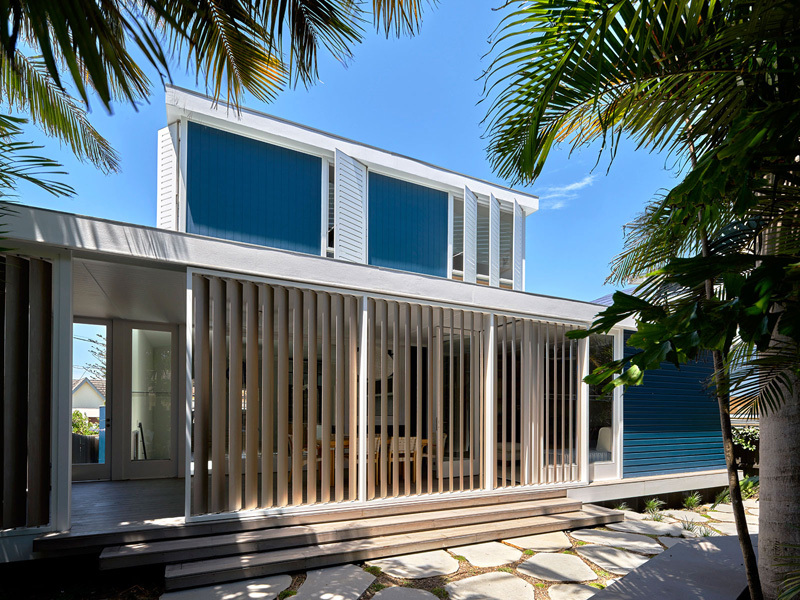 The Beach House is sitting on top of stilts and it blends the old and the new part of the house seamlessly. Beneath the stilts that elevate the house above the ground, there is a brass porthole window which is installed in the garage door- an ode to the ships that are sailing the ocean nearby. Let us take a look at the design of the house below. Unique feature: A modern house that has a design inspired by a ship. It even uses a color palette and other features that are an ode to ships. The design of the house is shaped like a ship on this part and I know that you will agree with me that it looks really nice especially with the glass doors and windows. Look at that lady. She really looks happy and relaxed while in the house. The house combines both traditional and modern elements which complement each other through the layered verandas. 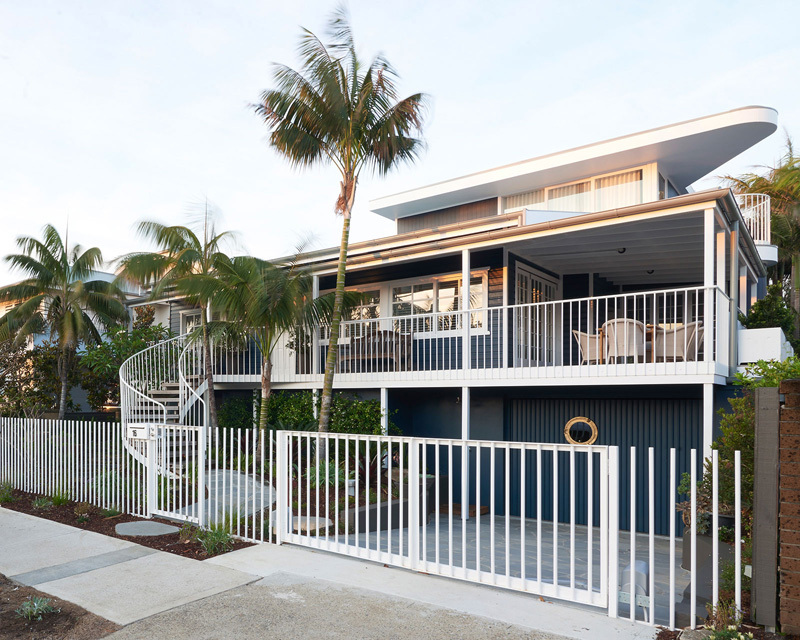 It even has a captains deck peeks out located from just above with unobscured ocean views. 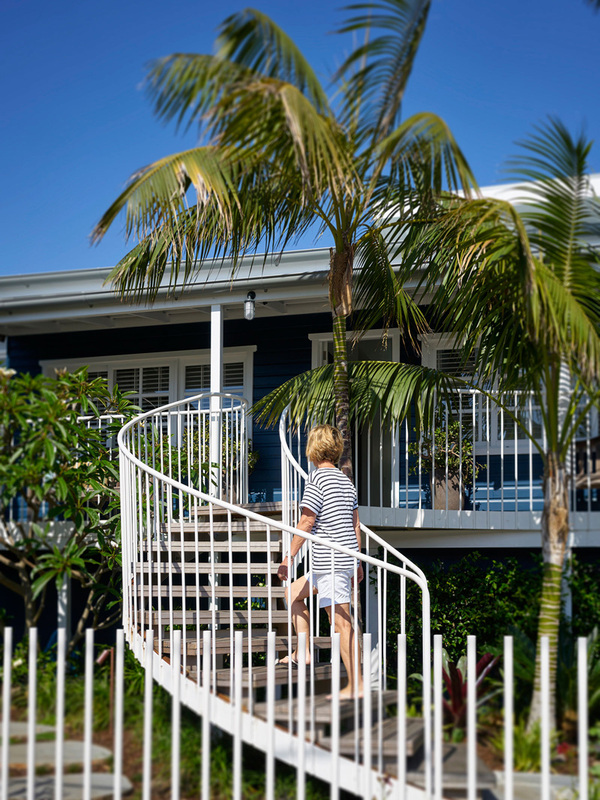 To enter the house, one would get into an elliptical steel spiral steps that goes through the palms. It is made from light stained timber decking that line the stair treads and the balustrade reflects the front white picket fence. The verandah of the home was extended to the side of the original ground floor living room. 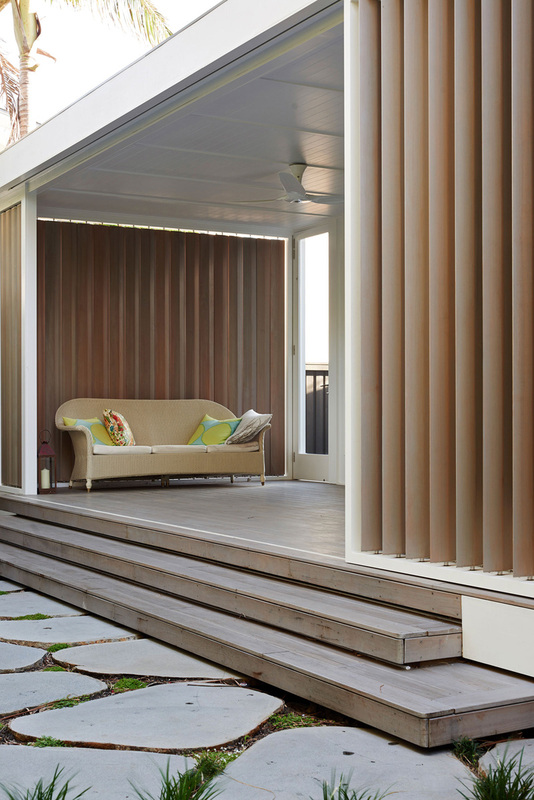 This way, the occupants are shaded from heat both internally and externally. Landscaping of the home is done by Chris Hunt of Landskill Pty Ltd who made sure that the trees, plants and others are well distributed around the house. There is a balustrade that enclose an elevated verandah retreat which is a perfect place for the owners to relax while they can also occasionally scan the ocean for migrating whales. The look of house changes when the massive timber and aluminum louvers and shutters are adjusted to open the building to light and natural cross ventilation. 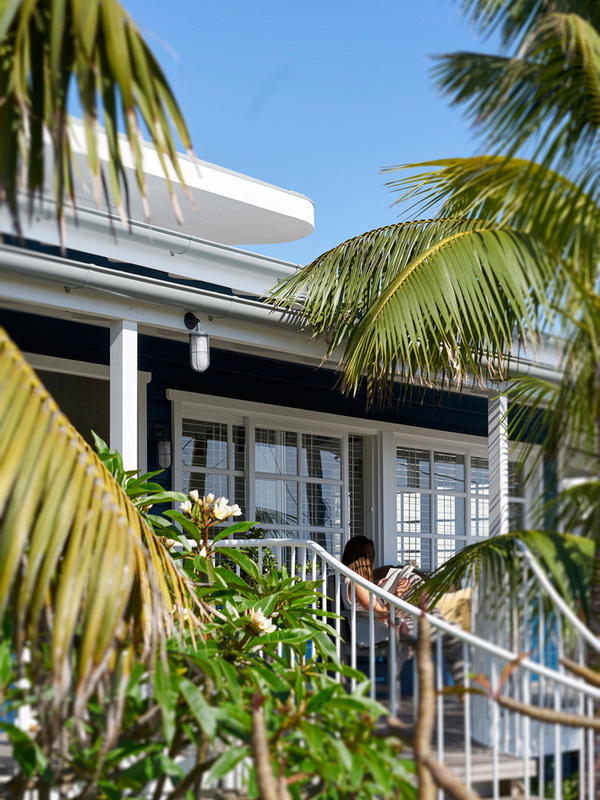 The house features a private garden room retreat that connects the indoors with the rear outdoor tropical garden as well as the entertaining area. The western red cedar shutters of the house protect the furnished retreat and also open up the house to the back yard. In order to maintain the original character of the house, ceilings and timber flooring were retained. Over the windows, new bookshelves were added to cover the existing walls, and add some insulation to the open living space. One of the highlight of the house is the limed timber stair treads on the staircase. 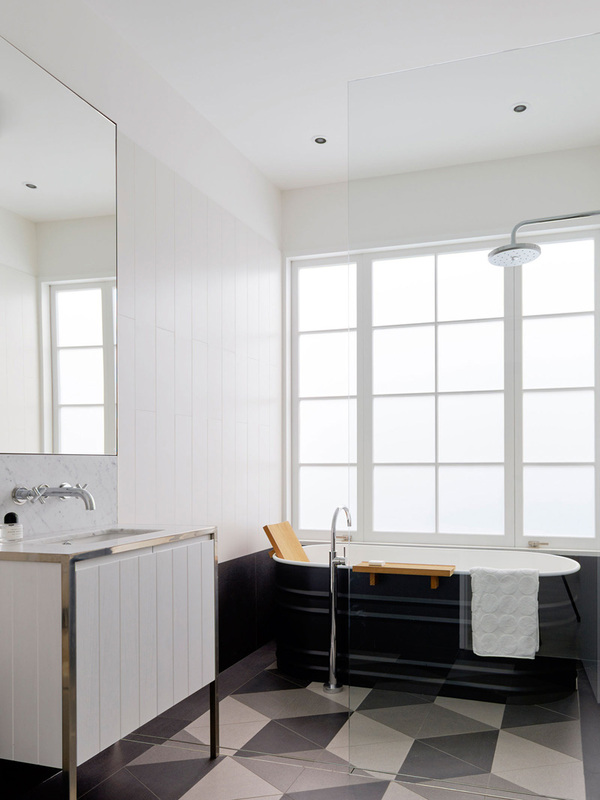 This is matched with limed original timber floorboards that weave together consistently through the spaces. 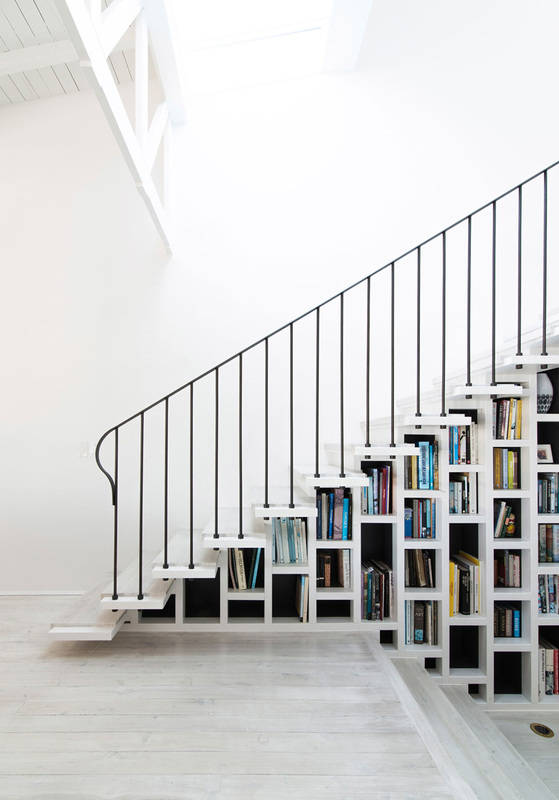 But it isn’t just a staircase since it features a bookshelf nestled between the studs of a wall supporting the staircase. The main support of the additions and roof in the first floor is large timber truss. This spans the edge of the light drenched stair void. You can also see that a large skylight is added to the center of the building that floods the interior with natural light. The hallway of the house is line with timber paneling and bookshelves as the stair treads lightly cantilever out from above. 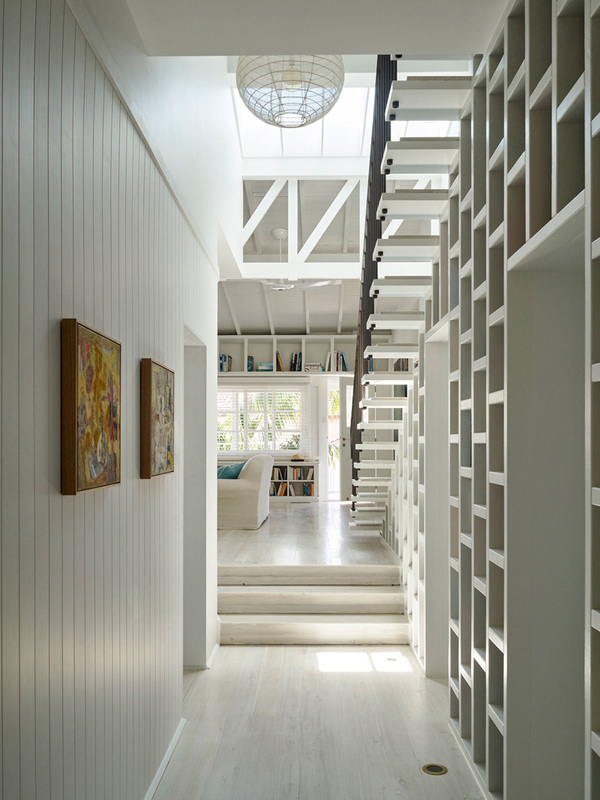 There is a recessed bookcase from the edge of the stair that widens the hallway and allows the light to flood through the open stair treads from the skylight above. 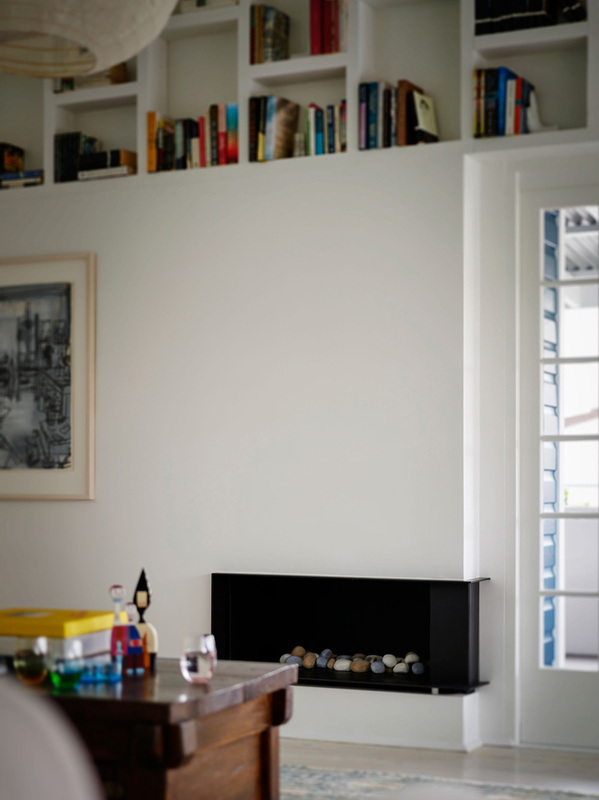 Seen in this photo is a new custom black steel gas fireplace which has been adorned with ceramic pebbles. Notice that its color is a nice contrast to the walls. 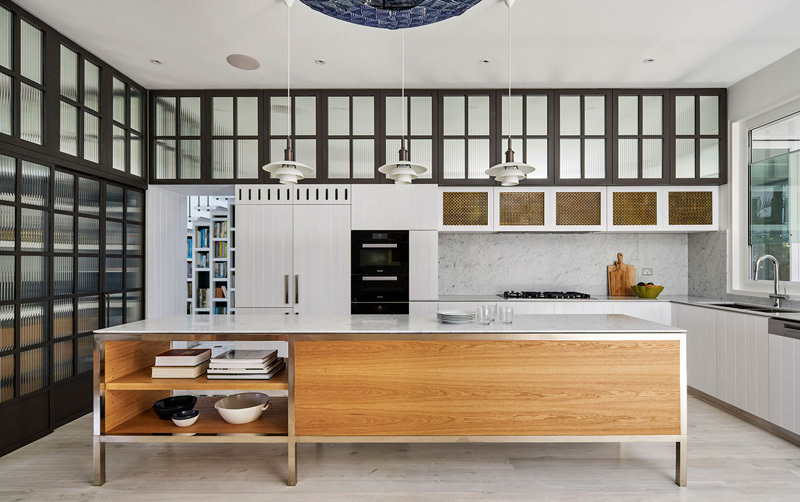 This is the beautiful kitchen that features a freestanding kitchen bench, framed in nickel plated brass structure, American oak infill and Carrara marble benchtop. In the rangehood, it has aged woven brass mesh panels to hide it. Above the island bench, there are a set of custom finish Louis Poulsen lights. 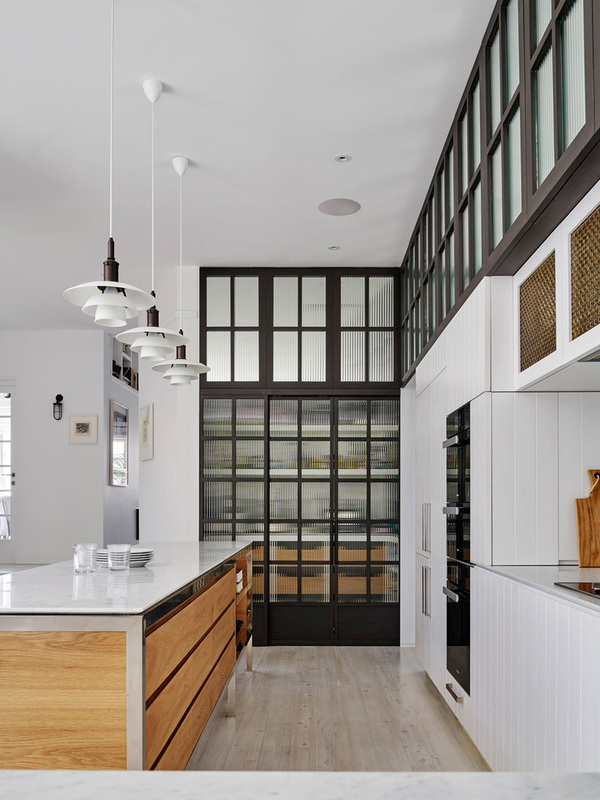 You can also see steel and timber windows with broadline glass that line the pantry and storage above. The dining area is just next to the kitchen. It is light filled and open with a paper feature light, designed by Paris Au Mois D’Aout. A small nook is intended to store the musical instruments and other related items. What I like here is the combination of white and wood and the lovely design of the counter height stools. 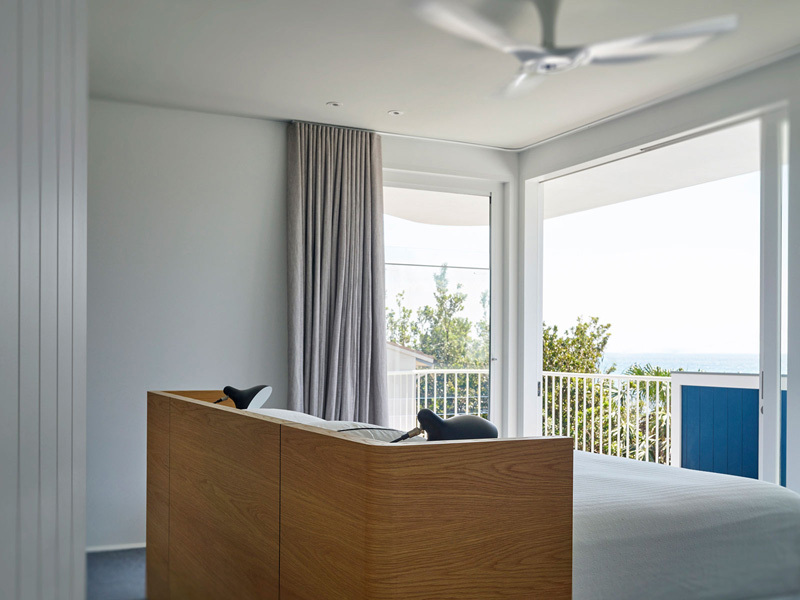 From the master bedroom, one can get views of the ocean through the floor to ceiling doors. It features a ceiling fan that silently keeps the occupants cool while ocean breeze flows through the room. 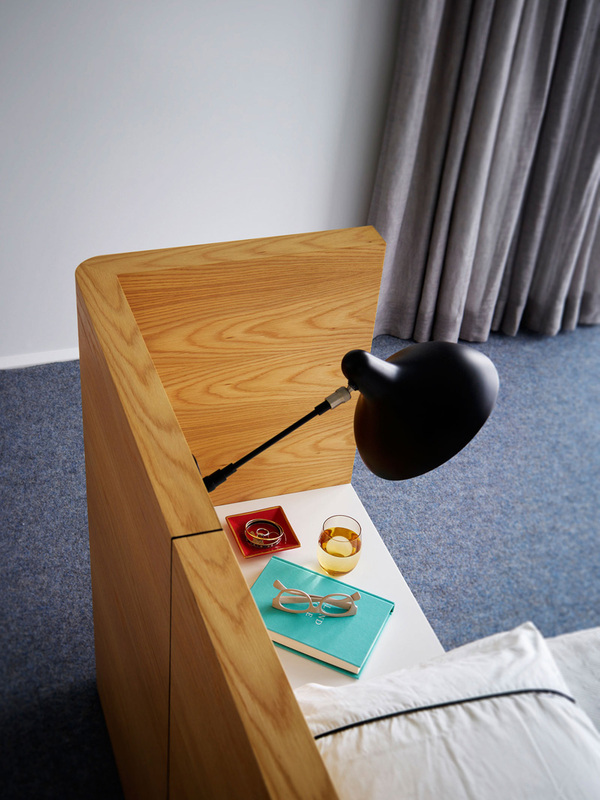 Notice that the American oak bed head has a bedside table enclosed in it which makes it even a lot cooler. One look at the house will surely make you think of the ocean because that is what came to my mind too. The house has many lovely features in it from the exterior to the interior. It sure is an impressive work by Luigi Rosselli Architects who made sure that the desire of the owner will be fulfilled. Also, what adds beauty to the house is its surroundings that has trees around it. As for the interior, it is very relaxing especially that it used wood and I like the staircase that features storage for books! Now it is your turn to speak up. Let me know what you like about the Beach House through the comment section below.